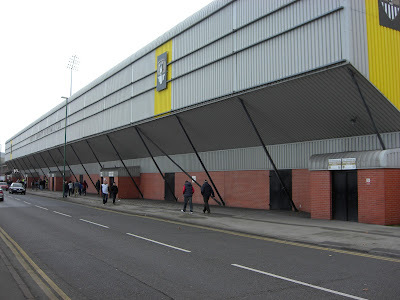 My seventy-ninth stadium of 2011 was on Saturday 26th November 2011 at Meadow Lane in Nottingham, Nottinghamshire. 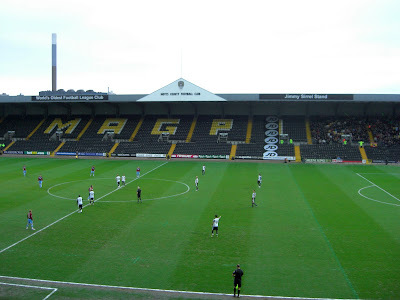 The match was Notts County vs. Scunthorpe United in Football League One. 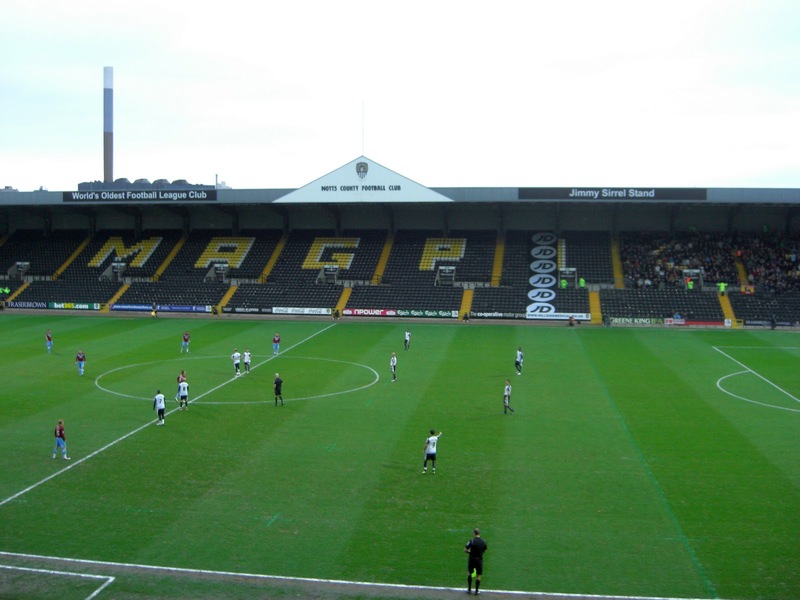 Meadow Lane is just over half a mile from Nottingham railway station and sits by the River Trent just to the south of the city centre. 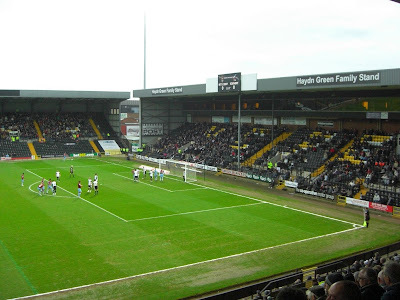 The ground has been home to Notts County since 1910. This was my second visit to Meadow Lane having been previously on 21st November 1998 to see Colchester United beat Notts County 3-1 in a Football League Division Two match. The stadium is largely unchanged since then having undergone substantial redevelopment in the early 1990s to convert it to an all-seater facility with it being one of the more impressive stadiums in the lower reaches of the Football League for most of this period. The Jimmy Sirrel Stand which runs the length of the pitch on the north-east side of the venue has a capacity of 5,775 though only a small section of it was open for the game with the away fans positioned in the southern corner of the stand. Opposite this on the south-west side of the stadium is Derek Pavis Stand, the largest stand in the ground. This 6,804 capacity structure houses the directors boxes, players changing rooms and club offices and is where I watched the match from. The Haydn Green Family Stand which sits behind the goal on the south-east side of the venue is the smallest in the ground with a capacity of 2,139. 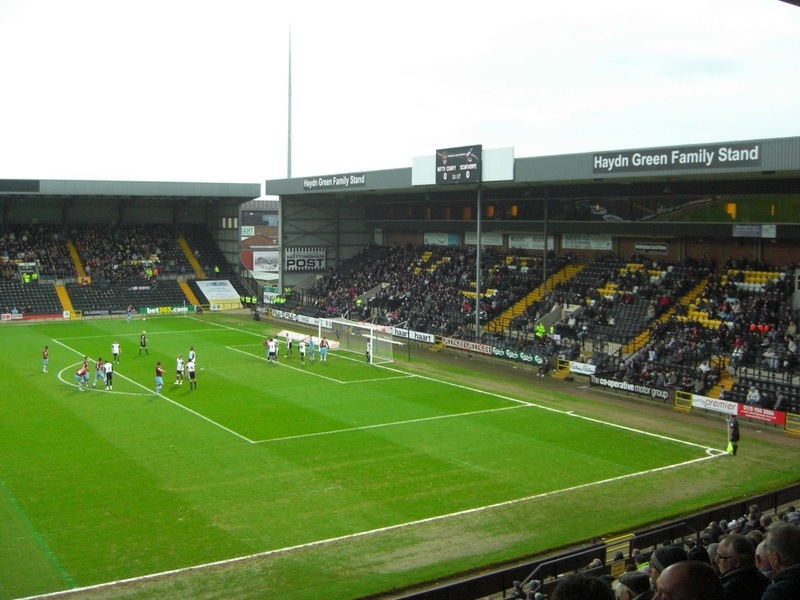 This area of Meadow Lane also holds the ticket offices and club shop. The remaining stand is the 5,438 seat Kop Stand where the most vocal home supporters are housed. This has improved the atmosphere greatly since I last visited when the home fans were dotted all around the stadium and didn't muster much in the way of noise. The game began with a dismal opening half-hour where very little happened but in the 39th minute one of the few chances was converted when Krystian Pearce steered a header past the goalkeeper after some neat link-up play to give the home side the lead. Just before the half-time whistle Scunthorpe equalised after Andy Barcham dispossessed a County defender and produced an excellent finish into the top corner. The visitors struck again on 53 minutes when Bobby Grant powered a great header into the goal from a cross, but just four minutes later the game was turned on its head after a wild tackle by Oliver Norwood earned the Scunthorpe man a red card. This was just the lift County needed and in the 64th minute Jeff Hughes volleyed home from 12 yards out to equalise. The home side continued to take advantage of their numerical advantage and had several good chances after this. Ultimately the game was won in the 82nd minute when a hopeful long-ball bypassed the entire away defence and left Julian Kelly clean-through on goal. He did not waste this opportunity and slotted the ball into the goal to Notts County a 3-2 victory and all three points.